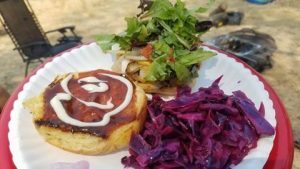 Eating is an important part of camping. You’re out there for a couple of days and you can just pack some dry food (crackers, cheese, nuts, etc) and some water, or you can actually pack your cooler with some easy to cook and easy to mix and match ingredients. 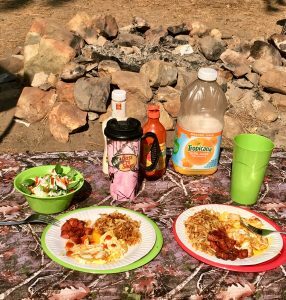 If you’re camping by yourself you might not care so much to have elaborate meals, but if you’re taking a family or go with friends, their camping comfort will depend on you. 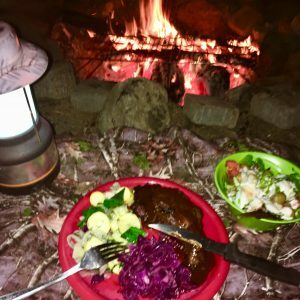 In this post I’ll show you how to become a Camp Chef, as well as some recipes, and tricks and tips. 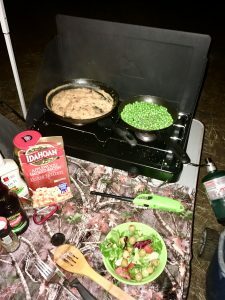 If you haven’t already read this earlier post about camping food, check it out here When I first started camping, I didn’t have a stove, therefore I didn’t bring any frying pans, or pots, etc. My cookware consisted of disposable foil containers. They were great: very light weight, I could cook anything in them, including heating up water, super cheap, and I did get quite a few uses out of them. 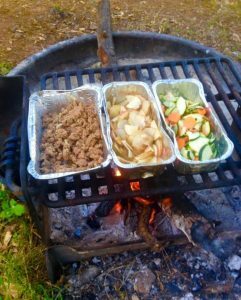 ground beef, potatoes and zucchini cooked on campfire in disposable foil containers. My go to food was: ground beef, potatoes and zucchini. They packed up very nicely, and provided an easy but still delicious and satisfying meal. I would simply cook the ground beef in one container with salt and pepper. I sliced up the potato into very thin slices (one large potato was plenty for dinner), the thinner the slices, the faster they cooked. I sliced up the zucchini into thicker slices. They cook fast anyways and I discovered that the thicker slices retain more flavor and have a better texture. Each ingredient had its own container, at the end I would mix the potatoes with the ground beef. 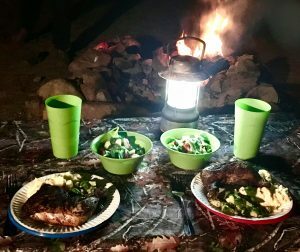 This was great and for the longest time this was my camp dinner, twice, if I stayed for two nights. 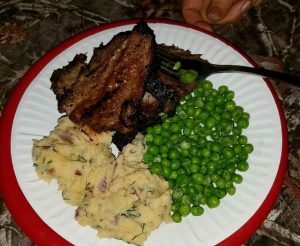 Then I realized that I can still have a variety of foods, and not just anything but high quality meat, almost any kind of vegetables (I’m no vegetarian but I do love my veggies) This results in not only delicious, but healthy meals with a variety of options. I count how many people and how many meals I’ll have. For example, it’s usually just me, and going Friday evening coming home Sunday midday gives me: 2 dinners, 2 breakfasts and 1-2 lunches. If you’re a cereal or oatmeal type person, you can do that as well. 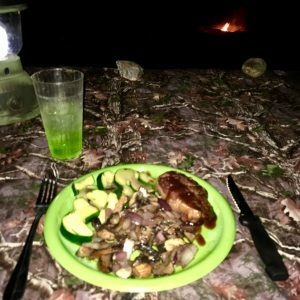 Dinner: I plan to make dinners bigger than lunches, as during the day I’m probably hiking or fishing, so my lunch might be left overs, or simply snacking on some crackers, or sandwiches. 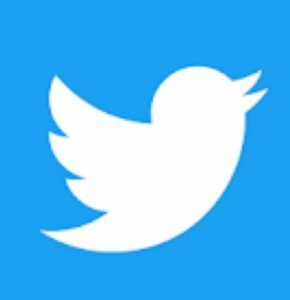 meat: I usually buy one type of meat only. I buy enough for two dinners and have some left over for lunch. starches: to complete the meal, you want something that cooks fast, and with the least amount of cookware. So for these reasons rice, dry beans and noodles are not included on my list but of course they’re doable. meat: You have many options: chicken, tri-tip or other type of steak, pork. 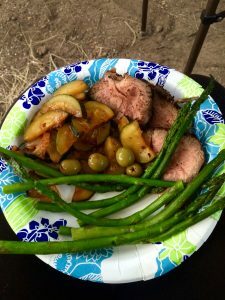 These I cook on the campfire. 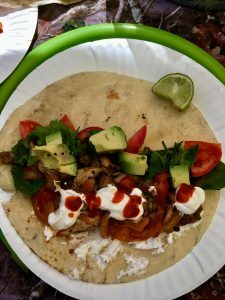 The next day I love making tacos out of the left overs, I might even opt for tacos for dinner. You can also take ground beef or hamburger patties. In addition I always make a big salad and eat that with every meal. baked potatoes are the easiest. Wrap it in foil and throw it in the fire. I love mashed potatoes from a bag, you can buy small seasoned packages they’re delicious. Most importantly you just need to boil water and mix it. Lunch can be a smaller version on dinner. It can also be sandwiches or just crackers, chips, cheese, nuts and a salad. If I’m at the campsite during lunch, I love making tacos out of left over meat from last night’s dinner. Make a salad as usual, cut up your meat from the night before, reheat in a little oil and garlic. 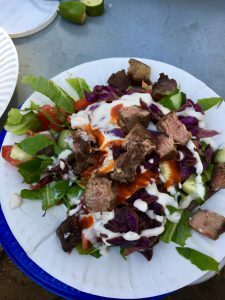 Add to the top of your salad, top with salad dressing and some steak sauce, barbeque sauce or hot sauce. Instead of the usual franks, (which are not very filling and honestly don’t taste too good), take some great quality Italian or Polish smoked sausages. You can cut these up and cook for dinner, and even cook them whole over the campfire. You just need hot dog buns. too complicated to make with various / too many cookware, etc. One example: lasagna. Although it’s delicious, it requires an oven, glass cookware, several other cookware to cook the noodles, the ground beef, etc. It needs many ingredients, it is very involved and takes a long time. Most things you could probably make on a campstove. 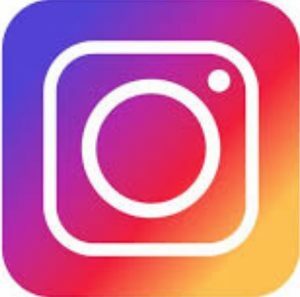 Think if it’s worth it: is it going take too long? That time could be spent kicking back enjoying nature, going for a quick hike, etc. Does it take way too many ingredients? If the ingredients for one meal take up half of your cooler, then maybe toss that idea, too. Especially in the summer months you want to make sure your meat doesn’t get spoiled. This is important in all seasons, but in the summer your ice in the cooler may be melted within 18 hours, whereas in the winter I’ve had chunks of ice after 3 days. Bring another cooler just for the meat, Mix the ice with large salt crystals, this will keep the ice frozen for a lot longer. Make sure you meat is in it’s original wrapping or in a sealed Ziploc bag and will not come in contact with the salt and the ice. When you pack your cooler, put the foods in plastic containers on the bottom. I usually put my vegetables in the plastic bag they came from the grocery store. These should not be on the bottom. Every time I forgot, I would have soaked vegetables sitting on the bottom of my cooler, completely immersed in water. condiments: mayonnaise, ketchup, mustard, etc. some food items like onions, potatoes, etc. 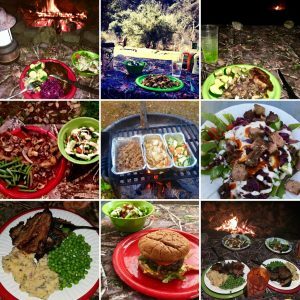 So next time you’re planning a camping trip take a look in your pantry and refrigerator, and think about your favorite foods: what can you make out there that you love to cook at home? Step out of your comfort zone and make this trip a little different. 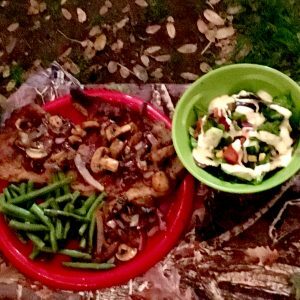 When you sit next to the campfire, and take the first bite of your perfectly cooked T-bone steak, with grilled mushrooms on top, a spoonful of mashed potatoes and your favorite vegetables, you will never want to do camping any other way. 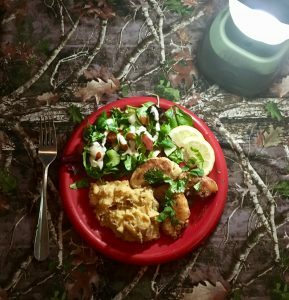 This entry was posted in Camping 101 (7) and tagged camp breakfast, camp chef, camp dinner, campfire cooking, camping, camping 101, camping tips, camping trips, campstove cooking, cooking, cooking by campfire, healthy cooking, outddors, outdoor dinners, outdoors cooking, tips and tricks for camping on April 7, 2018 by Marianna.